Is anyone privy to what the maintenance on this bike might be, compared to the H2? Reading about there seems to be a lot of trepidation about this, considering the H2R has no warranty at all, and the H2 series seems but be on the "highly strung" end of motorcycling. I guess the good news is that the engine foundation has been out for about 3 years, used and utterly abused by riders who drag and to endless top speed runs on highly modded H2/H2Rs. 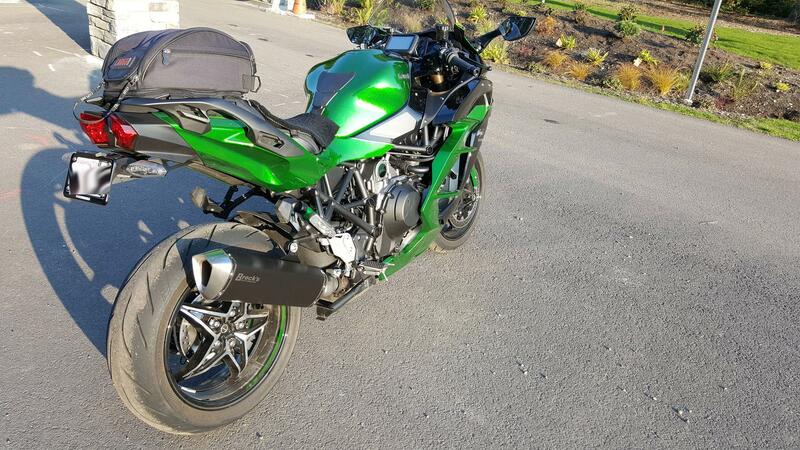 I'm going to guess that the maintenance schedule looks closer to the old Ninja 1000 than the H2 or H2R, and I don't believe there will be anything too special in there except the inspection of the supercharger unit itself, which isn't often on the H2. I do worry a bit about how difficult it will be to get into the head to do a valve-check, but I'm sure they've got it setup pretty easy somewhow. Kawasakis have always been some of the easiest bikes to work on for me. I found the H2 users manual online with a simple google search. Maintenance looks pretty typical with 15000 mile valve adjusts and some inspection for the impeller shaft, but I saw nothing unusual about the schedule compred to other bikes. Here's a link to the H2 manual. Maintenance schedule starts on page 130. the only atypical thing is "Supercharger axial play" which is inspection every 12,000miles. Yes, 12000 kilometers, ~8,000 miles. I read the table wrong. Oooo new icons.